ATLAS ransomware uses sophisticated techniques to infiltrate computers and hide from its victims. Use Reimage to determine whether your system is infected and prevent the loss of your files. ATLAS virus operates as ransomware which is devised to encode users’ personal files with the combination of AES+RSA-512 algorithms. This peculiarity makes the malware a full-fledged virus despite its plain design. In the ransom message, it provides three email addresses: atlashelp@protonmail.com, atlasfix@protonmail.com, and atlasfix@dr.com. It marks the encrypted files with .ATLAS file decryption. In the ATLAS_FILES.txt, the malware authors alarm victims to use any third-party decryption software but instead follow their requirements. The malware was constructed on the basis of Dale and Chip ransomware infections. It is common tendency to exert pressure on victims. Instead of giving into their manipulations, we offer you to start ATLAS removal. OYou can speed up the process with Reimage or Plumbytes Anti-MalwareMalwarebytes Malwarebytes. The ransom message of ATLAS virus is almost identical to the one displayed by Chip malware. Currently, there has been a string of crypto-malware threats which present the demands in the plain .txt file. The majority of them were based on the open source HiddenTear virus. Nonetheless, this time, the developers of Dale and Chip viruses fall to be the prime suspects for creating this virus. Similarly to the design of the former threat, ATLAS malware three alternative email addresses for the public. It also repeats the identification code of a victim several times. Taking a look back at the former attempts to extort money, the cyber crooks seem to have knowledge how to use Tor and dark web for disguising their identity. The files are encrypted with an elaborate encryption method which suggests that the felons are not newbies. What is more, they do not indicate a specific amount of ransom. The victims are supposed to contact the racketeers and follow further instructions. Let us warn you not to install their suggested software, but in fact, remove ATLAS right away. 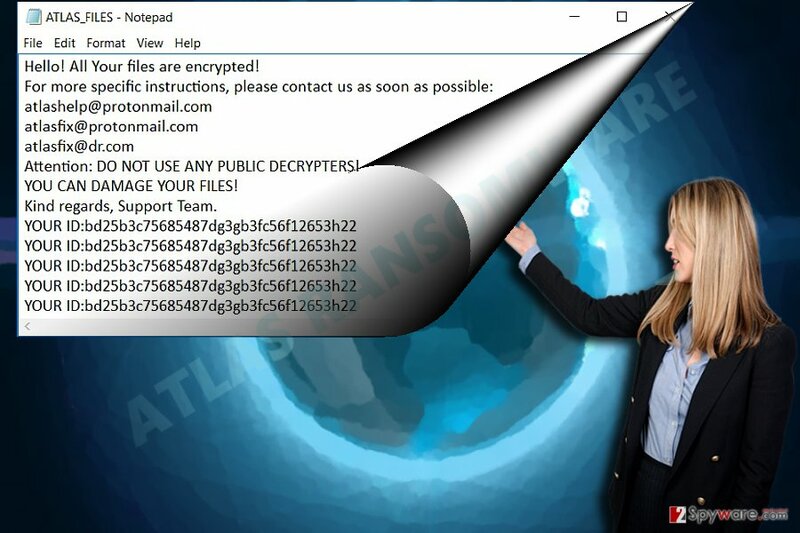 Despite slight alterations in the modus operandi, ATLAS ransomware spreads the same way as other file-encrypting threats. You may notice it as an email attachment added to the email named as an important invoice or subpoena to the court. Note that ATLAS hijack may also occur if you tend to visit peer-to-peer file sharing domains, gambling, and gaming web pages. Fewer samples reveal the tendency that some fraudsters shift their attention to browser plug-ins. If you come across a website which suggests you enable a browser extension, do not rush to do it. Instead of temporal access to feature or service, you may accelerate the infiltration of a file-encrypting threat. Taking into account the fact that this malware is a derivative version of previously mentioned viruses, you should not underestimate it. Thus do not waste time and entrust ATLAS removal to an anti-spyware tool. Do not get surprised if this malware modifies the system settings and you will not be able to run the application. In that case, the below-displayed guide will be of practical use. After you regain full access, remove ATLAS virus. Regardless of crooks’ alert not to use third-party decryption software, disregard such “recommendation.” You will find useful tips under “Bonus: Recover your data” headline. Note that your vigilance pays a significant role in the cyber security. Log in to your infected account and start the browser. Download Reimage or other legitimate anti-spyware program. Update it before a full system scan and remove malicious files that belong to your ransomware and complete ATLAS removal. System Restore is another alternative to regain full control of the device. When a new window shows up, click Next and select your restore point that is prior the infiltration of ATLAS. After doing that, click Next. Once you restore your system to a previous date, download and scan your computer with Reimage and make sure that ATLAS removal is performed successfully. Guide which is presented above is supposed to help you remove ATLAS from your computer. To recover your encrypted files, we recommend using a detailed guide prepared by 2-spyware.com security experts. This program is designed to restore files if they were lost during a system crash. It might help you restore your valuable encrypted documents as well. There is no information whether ATLAS virus deletes shadow volume copies in advance so you might have another chance to retrieve your files. ^ Steve Ranger. Ransomware is now so awful it's actually making us take security seriously. ZDNet. Technology News, Analysis, Comments, and Product Reviews for IT Professionals. ^ Lawrence Abrams. RIG-E Exploit Kit now distributing New CHIP Ransomware. BleepingComputer. 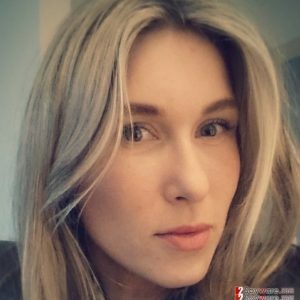 News, Reviews and Technical Support. ^ Dennis Fisher. Cerber Ransomware Seen Using Tor. OntheWire. Pindrop's exclusive news source. ^ Joe Uchill. New ransomware demands political statements, not money. The Hill. Covering Congress, Politics, Political Campaigns and Capitol Hill. ^ Clint Boulton . Humans are (still) the weakest cybersecurity link. CIO. Information Technology Strategy for senior IT management. This entry was posted on 2017-04-20 at 02:20 and is filed under Ransomware, Viruses. You can quickly scan the QR code with your mobile device and have ATLAS ransomware virus manual removal instructions right in your pocket. How did you remove ATLAS virus?